Optima Diagnostic Imaging has a state-of-the-art Computed Tomography (CT) scanner that produces clear, sharp, high-quality images of any body part, such as the chest and lungs, abdomen, pelvis, bones, blood vessels, brain, and tissues to help diagnose abnormalities including tumors, bleeding, bone calcification, and cysts. Our CT produces high quality cross-sectional images in a series of slices that are manipulated in a computer to produce high resolution, 3D images. These scans are also called CAT scans. Patients may need to fast or receive contrast dye before being scanned. For the imaging scan, patients are positioned on a narrow table which glides into the scanner while pictures are taken. Patients need to remain motionless during imaging. CT scans are extremely fast and painless procedures, available at our Los Angeles imaging facility. 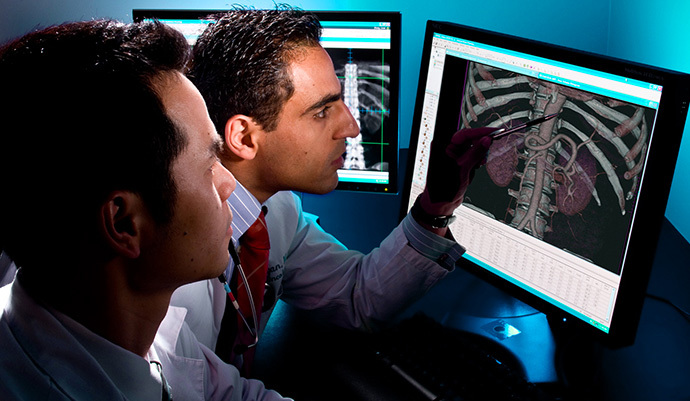 Computed tomography (CT) combines the use of X-rays with the latest computer technology to take detailed images of any body part, including the CT lung scan at our Los Angeles imaging facility. Using a series of X-ray beams, the CT scanner creates cross-sectional images. A computer then reconstructs the "slices" to produce the actual pictures. Considering that some slices are as thin as half a centimeter, a CT scan offers much more image detail than a traditional X-ray, which means your doctor obtains detailed images to help make the most accurate diagnosis. Your doctor may recommend this type of diagnostic imaging procedure when there is a need to evaluate bone or soft tissue. Since CT scans are able to capture information in a cross-sectional format, your doctor is better able to view the size, shape and position of soft tissue structures than if using regular X-rays. For a CAT Scan at our Los Angeles facility, you will lie on a narrow table that moves through the scanner. Scanning usually takes only a few minutes, although total exam times will vary depending on the specific study being performed. You may ask your doctor or our staff for exam duration specifics. When the exam begins, the table will move to a starting position, pause and then move to the final scanning position. On the table, a donut-shaped structure, “the gantry” will surround you. This houses the X-ray tube that generates the invisible X-ray beams. The gantry produces little noise. You may only hear mechanical humming, which is the sound of the X-ray tube rotating inside the gantry. During the scanning process of your CT scan in Los Angeles, you'll be required to lie very still and may need to hold your breath as instructed by the technician performing your exam. Some exams require oral contrast or intravenous dyes, to help enhance the visualization of certain tissues. If IV Contrast dye is needed, it is administered by injection into a vein. You may feel a slight sensation during this injection. Although contrast is not harmful, it is commonly iodine-based, which can trigger an allergic reaction in some patients. Those persons who are allergic to iodine should notify their doctor and our staff prior to any CAT scan. Other risks include receiving "ionizing" radiation, which occurs during all CT and X-ray exams. Ionizing radiation may be harmful to an unborn child, and pregnant women should not receive a CT imaging study. MRI scans do not produce radiation, and your physician may require a MRI exam if you are pregnant. We stress the importance of your safety and health, and as such work to deliver among the most standard CAT scans Los Angeles has to offer you. Should contrast media be necessary for your CT scan in Los Angeles, your doctor will advise fasting for four to six hours prior to your exam. Some abdominal exams may also require that you fast before the exam to ensure the best possible images. Be sure to clarify preparations such as these with your doctor in advance. 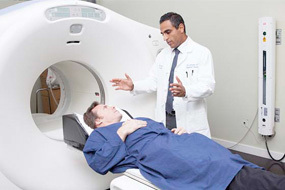 CT scans, like other X-rays, are monitored and regulated to provide the minimum amount of radiation exposure. X-rays themselves are painless. Women who are pregnant, however, should not undergo X-ray procedures, as there are risks to the fetus. It's important to discuss any allergies, medications and existing conditions with your doctor before undergoing any type of diagnostic exam. The CT center at Optima Diagnostic Imaging has been awarded accreditation after a comprehensive review performed by the American College of Radiology (ACR). This certification confirms that our center meets rigorous standards for practice in CT. We pride ourselves on delivering among the safest CT scans Los Angeles offers.